It’s the fastest and fiercest snowmobile on the planet, end of story. And it’s a joy to ride, too, with a low ride height, optional iACT Adjustable On-the-Fly Suspension and more. FOX ZERO IQS SHOCKS: No matter your riding style — or what the day brings — FOX ZERO iQS shocks will be ready. Featuring three compression settings (soft, medium and firm) that can be easily adjusted with a dial mounted on the remote reservoir, FOX ZERO iQS shocks are built for changing terrain. Their remote reservoir delivers fade-free runs, while coil-over springs even out the bumpiest rides. Available in 1.5- or 2.0-inch diameters. IACT ADJUSTABLE ON-THE-FLY SUSPENSION: Changing terrain should never interrupt your ride. With iACT, it never will. iACT Adjustable On-the-Fly Suspension lets you change suspension firmness as easily as you'd change the radio station. At the push of a button you can toggle between a soft, medium or firm settings on your FOX ZERO iQS gas shocks, and your ride will adjust automatically and immediately. 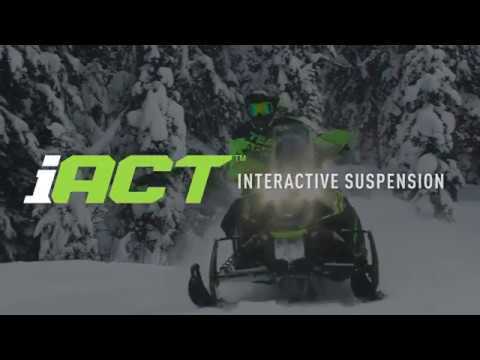 iACT also lets you fine-tune the ratio of control between ski shocks and rear track shocks, and can remember two driver profiles within their own customized settings. No more hopping off to fine-tune the shocks, which means more time riding. 9000-SERIES C-TEC4 TURBORCHARGED ENGINE: ZR Thundercat doesn't mess around, with our biggest, most powerful engine. The 9000-series C-TEC4 turbocharged three-cylinder engine delivers max horsepower in any conditions. The ultimate 4-stroke powerhouse, it produces 200HP-class performance at 8750 RPM. This 998cc engine features ultra-quick throttle and turbo response from an intercooled turbo, plus a DOHC design that’s matched with 4-hole fuel injectors to create maximum performance with minimal weight. You also get engine braking control via an idle speed circuit and engine mapping, lightweight aluminum cylinders, and a press forged crankshaft. 1.0 in. RIPSAW TRACK: Ripsaw’s angled lugs grip the trail, while the chopped design provides unmatched handling and acceleration. Chassis overall - 125 in. Chassis overall - 52 in. Chassis overall - 48-49 in. System capacity - 5.7 qt.